I was tidying my room this evening and putting away my nice clean, ironed jeans when I thought how many pairs of jeans do I really need? I have lots of jeans and can only wear one pair at a time but how many of them fit me well and make me feel good? Jeans are such an easy thing to wear. You can dress them up with heels or put on a pair of flats for a casual look. Some high street stores sell them for as little as €10 so picking up a new pair without really needing them is easy. A recent poll found that on average women own 7 Pairs of Jeans but only Wear 4. The poll also found that, on average, women spend just €34 for a pair of jeans. Age 18-34, are more willing to splurge, spending on average €60 on a pair. However, 1 in 10 women say they have spent more than €100 on a pair. 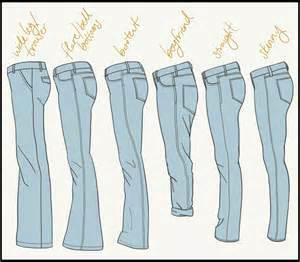 Lots of us have trouble finding the perfect pair of jeans that fit and flatter no matter what size or shape we are. If you shop for jeans you will find jeans of all sorts: tummy-tucking, booty-boosting, skinny leg, wide leg, mid rise, high rise, the list is endless. A pair of jeans that will look nice on one person may look completely different on somebody else. So how do you find the perfect pair of jeans? In general, denim is going to stretch about a half-size with wear. This is VERY IMPORTANT. Most pairs contain about 2% spandex so they’ll move with you and form to your body. Jeans should fit snugly on your first try but there is a fine line between snug and tight. Badly fitted denims can look terrible. Get a style that suits your shape and stick with that style. Don’t rush to pick up those slim-fit or other styles that look so good on models. If you have a full figure stay away from tight-fitting denims. Very baggy fits don’t look great either so make sure and try on a variety of styles until you are happy with the style that suits your shape. Semi-slim or straight-fit is the best silhouette for an average body type. If you have never had a designer pair of denims then now might be the time. Why pay a lot of money if you can get them at much lower prices at discount stores like TK MAX. When it comes to designer jeans I have found great bargains in TK Max. Designer denim is made of more durable fabric so it lasts longer and keeps it shape. If you wear jeans on a daily basis, it makes sense to spend a bit more money on something that will last. Remember the perfect pair of denims can be an investment. With the evolving technology in denim production, there is a wide range of colours available but remember that colours depend on the occasion. Opt for lighter tones if you are hanging with your buddies, and darker ones for office. When it comes to washes, go for stone-washed denims rather than bleach-washed denim for regular wear. So now that you have a few tips on how to pick the perfect pair of jeans, clear out the ones that you will never wear again from your wardrobe. If you have a pair of jeans that you like to wear then wear them with confidence and enjoy shopping for similar styles. Remember don’t be influenced in what others wear. Feel confident in the jeans you choose and wear them with a smile.